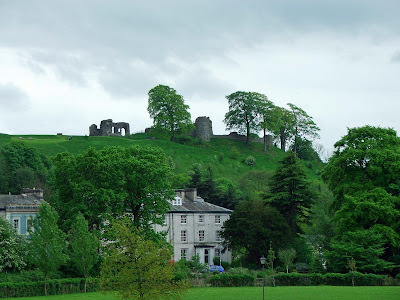 Here are a few more views of Kendal Castle, a site that seems to change with each day!! Below, a view of the castle from across Goose Holme by the river. 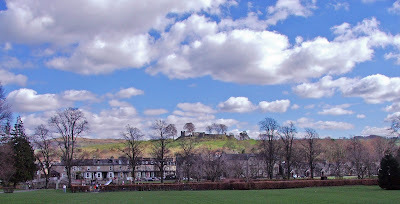 (click to enlarge) The trees were planted on the castle's slopes sometime around 1813, when the whole of Castle Hill was owned by the Dowker family. At this time, much of the castle's wall was capped and other stone work was repaired and secured. 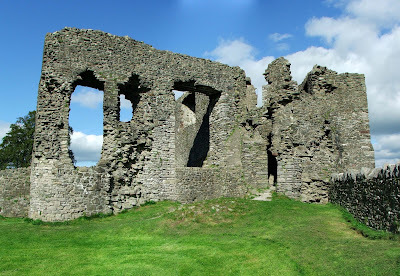 Kendal castle has a distinct lack of architectural points that can aid the visitor with dating its fabric. It's likely that the early 19th century consolidation work that was carried out was responsible for this. Below, a view of Kendal Castle taken in the snow in December 2008(click to enlarge) It is thought that the castle started off its life as a ring work, much like Pennington near Ulverston. The moat is surmounted by a bank, upon which the wall is built. There's every possibility that the castle was temporarily set up as a ring work structure, for the duration of its construction, to give its builders an element of protection.